2046 is a 100% Sativa feminized Marijuana with an overwhelming psychedelic effect and an unmistakable Haze aroma. It gives some work but the results are rewarded. Not suitable for beginners. 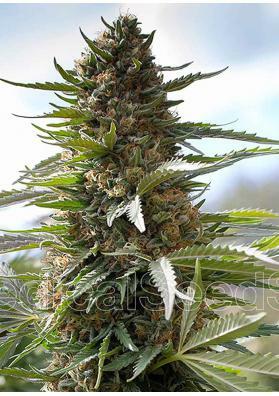 2046 is a strain of feminized Marijuana, 100% sativa, the result of crossing several pure sativas. It is the most powerful and cerebral strain and perhaps also the most difficult to grow, but the results that offers compensate for all the dedication and effort. It provides a very powerful and energizing psychedelic effect with a lot of mental activity and an unmistakable Haze flavor. Thanks to its high content in THC, medicinally, is a very suitable plant to treat diseases like glaucoma and epilepsy. 2046 is a difficult Cannabis to grow, not suitable for beginners, challenging any farmer who grows Marijuana. This plant can be cultivated only under a SCRoG or in very tall crops with support. The flowering is extremely late but it produces an incredible amount of flowers, super powerful, and also yields an outstanding volume level. In indoors, you must be patient: first the plant needs a vegetative period of 1-2 weeks and then it will not flourish until after 95-110 days, but when it does you can collect up to 500 grams of ultra-psychedelic Marijuana per square meter. In the outside, the plant grows quite enough, it can reach heights of between 2.5m and 3m and you will not be able to harvest it until late November, but the surprise that it gives you when you see the crops up to 1kg per plant can not be described with words. Enjoy this cerebral strain that rewards the effort with strong hits.